If you’ve been hiding in a dark, dusty corner of a bubble on the outside of the universe (well, it’s nothing like that… Yeah. No. But if it helps, yes) then you may not have heard that Doctor Who is coming back for the second half of the season with a new companion. They’ve even released this nifty trailer. 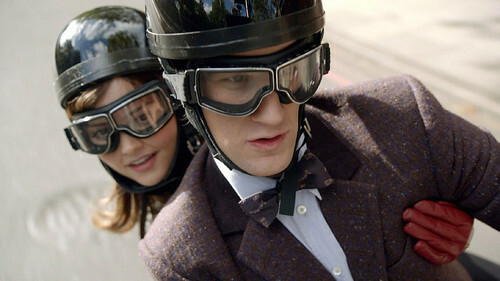 In these episodes, The Doctor (Matt Smith) is joined by his new companion Clara (Jenna-Louise Coleman) for the latest set of incredible adventures through space and time. The duo finds new adversaries and familiar friends around every corner as they journey from the bottom of the ocean in a submarine to the center of the TARDIS and beyond. The Cybermen make a thunderous return and the Ice Warrior arrives in an unexpected place. In the premiere, a modern-day urban thriller called “The Bells of Saint John” written by lead writer and executive producer Steven Moffat (Sherlock) and set in London against the backdrop of new & old iconic landmarks, a new nemesis – the Spoonheads – battle the Doctor as he discovers something sinister is lurking in the Wi-Fi. Get out those Sonic Screwdrivers and program your DVR for March 30th. In the meantime watch Craig Ferguson on CBS tonight as the Jenna-Louise Coleman will be a guest.